Advocacy workshops help raise awareness on wildlife trafficking amongst Chinese nationals living and working in Kenya and Botswana. Nairobi, Kenya and Gaborone, Botswana, 27 March 2019: China’s National Forestry and Grassland Administration (NFGA) and World Wide Fund for Nature (WWF), supported by the Chinese Embassies in Nairobi and Gaborone has concluded two advocacy workshops raising awareness on wildlife trafficking amongst Chinese nationals living and working in Kenya and Botswana. The two workshops which took place on 25 March in Nairobi and 27 March in Gaborone respectively were attended by more than 200 Chinese nationals working in State-owned enterprises, private businesses and residing in the two countries. Local wildlife conservation authorities and both local and international media were also present. These workshops follow bilateral meetings between China’s president Xi and the two African leaders, Kenya’s President Uhuru Kenyatta and Botswana’s President Mokgweetsi Masisi respectively, during the 2018 Beijing Summit of the Forum on China-Africa Cooperation (FOCAC) in September where the three Heads of State committed themselves to enhancing cooperation across various sectors including wildlife conservation. Chinese citizens are among the large number of global tourists who visit Kenya each year to witness the seasonal migration of wild animals across the Maasai Mara grasslands, home to over 20 migratory species, including the African Elephant. Kenya and China recently collaborated on the Nairobi-Mombasa Madaraka Express Railway, Kenya’s biggest infrastructure project since its independence, which also represents an important component of China’s Belt and Road Initiative. Botswana is home to about 130,000 elephants based on its latest survey in 2014, conducted jointly by Elephants Without Borders and Botswana’s Department of Wildlife and National Parks (DWNP). With the recent expansion of Chinese investment in Africa, incidences of ivory smuggling involving Chinese nationals continue to be reported with serious reputational risks for China internationally. The strengthening of laws to address illegal wildlife trade and the imposition of increasingly tougher penalties by many African Local governments has meant that Chinese citizens based in these countries need to be more aware of these regulations and the consequences of engaging in wildlife crimes. In his opening statement, Peng Youdong, Deputy Minister of NFGA in China condemned the recent spike in poaching and smuggling activities targeting various species including: African elephants, rhinos, pangolins and rare timbers, which he said has become an issue of global concern. He said China’s recent decision to close its domestic ivory market, to ban the commercial processing of rhino horn and tiger bone, as well as its tightening of legislation governing the trade in other endangered wildlife species demonstrates the government’s commitment to tackling illegal wildlife trade. The government is now stepping up its enforcement efforts to ensure these important legislative changes bear fruit. This includes intensified monitoring of its markets, crucial transport links and increasing border inspection. This workshop is also part of the Chinese government long-term strategy to educate its citizens living and working in Africa to ensure they adhere to the international laws governing the trade in wildlife and on becoming model citizens abroad. 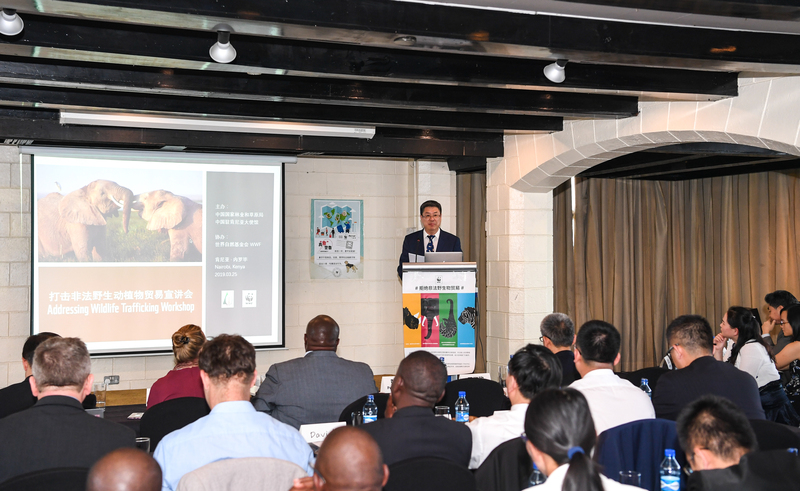 The representative of China’s CITES MA spoke about China’s implementation of CITES, and highlighted the implications of the Chinese domestic ivory trade ban and domestic legislation on wildlife protection. They also presented the management efforts made by the Chinese government to protect wild animals and plants. WWF spoke about trends in African Elephant and rhino poaching and the associated illegal ivory and rhino horn trade. It noted that those convicted of wildlife crime faced harsh penalties in many African countries. Kenya, Tanzania and Ethiopia have all recently strengthened their penalties. During the visits, constructive bilateral consultations also took place between China’s National Forestry and Grassland Administration and their counterparts in Kenya and Botswana respectively. Both sides recognized their shared responsibility in ensuring compliance with CITES regulations and agreed to strengthen information exchange and wildlife conservation advocacy to prevent the poaching and smuggling of illegal wildlife products. At the end of the workshop, a public pledge to say no to illegal wildlife trade was made by the representatives of the local Chinese nationals and companies in Kenya and Botswana. This was the 15th outreach workshop of its kind jointly conducted by WWF and NFGA in collaboration with various Chinese Embassies in Africa. Convention on International Trade in Endangered Species of Wild Fauna and Flora. Peng Youdong, Deputy Minister of NFGA in China; Wang Xuezheng, Counselor of the Embassy of China in Kenya; Dr. Patrick Omondi, Ag. Director Biodiversity, Research & Planning of Kenya Wildlife Service; Zhao Yanbo, Ambassador of the Embassy of China in Botswana; and Thato Yaone Raphaka,Permanent Secretary, Ministry of Environment, Natural Resource Conservation and Tourism. Zhou Fei, Chief Programme Officer of WWF China and Dr Margaret Kinnaird, Global Wildlife Practice Leader made the opening remarks on behalf of WWF. Dr. Meng Xianlin, Director General of NFGA’s International Cooperation Department hosted both workshops.